I think I went on my first snipe hunt when I was about five years old. Big Brother Bill, probably upset that The Mom had once again told him to take me with him, told me to go down to the wetlands on Lake Washington and find a snipe. 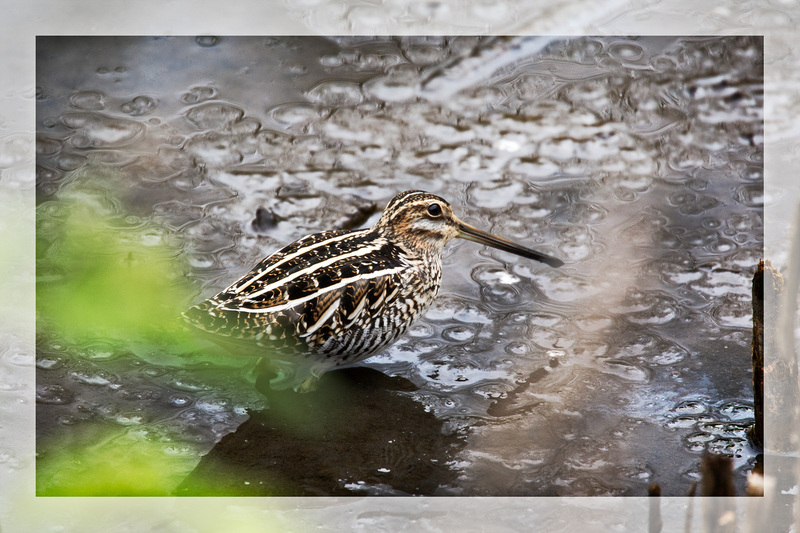 I looked for a snipe many times after that, at least until we moved to Walnut Creek, California when I was 9 and there wasn’t a wetland in sight. Eventually, probably somewhere around 50, I realized that there was no such thing as a snipe, that it was just a way for Big Brother Bill to get rid of me. Turns out I was wrong, at least about there being no such thing as a “snipe.” When I started birding several years ago I bought a book called “Birds of the Puget Sound Region” and, sure enough, there on page 162 was a picture of a Wilson’s Snipe and a short description. Judging from the stocky photo, I thought snipes were a fairly large bird, though it turned out they are really about half the size of a crow. I’ve been looking in vain for snipes ever since I saw that photo. Eventually, I found a snipe in the background of one of my shots. That didn’t feel like it really counted as seeing a snipe, though. I finally saw three snipes at a distance while birding Malheur last year. That’s when I first realized how small they are. The shots I got might have served as proof that I’d actually seen a Wilson’s Snipe, but they weren’t good pictures. I finally got a decent shot of a Snipe about two weeks ago at Theler. I gentleman stopped me on the trail and asked me to identify a photo he had taken at the beginning of the trail. After I identified it as a Wilson’s Snipe, I asked him where he had taken the shot. Unfortunately, it was at the opposite end of the trail, but when I got there nearly an hour later it was still there, though not out in the open as it had been when he took the pictures earlier. The snipe was tucked in next to the bank and was barely visible through all the foliage on the bank. Naturally when I maneuvered to get a clearer shot, it flew off to the next pond. I figured since it had been where it was an hour ago that it might return to the same area once I had left. When I got back half an hour later, it had returned to nearly the same spot and I managed to get a little better picture. Although there is still some distortion a the bottom of the picture from the foliage in the foreground, I’m quite happy with the photo. That’s good, too, because judging from experience it will be quite awhile before I manage to get a better shot. 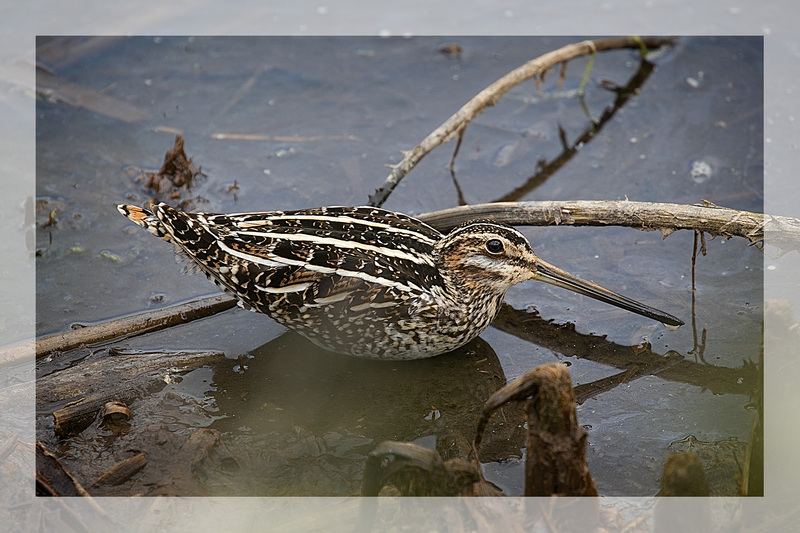 Love seeing these photos of the Wilson’s Snipe. Quite a beautiful bird. Also love your boyhood story.